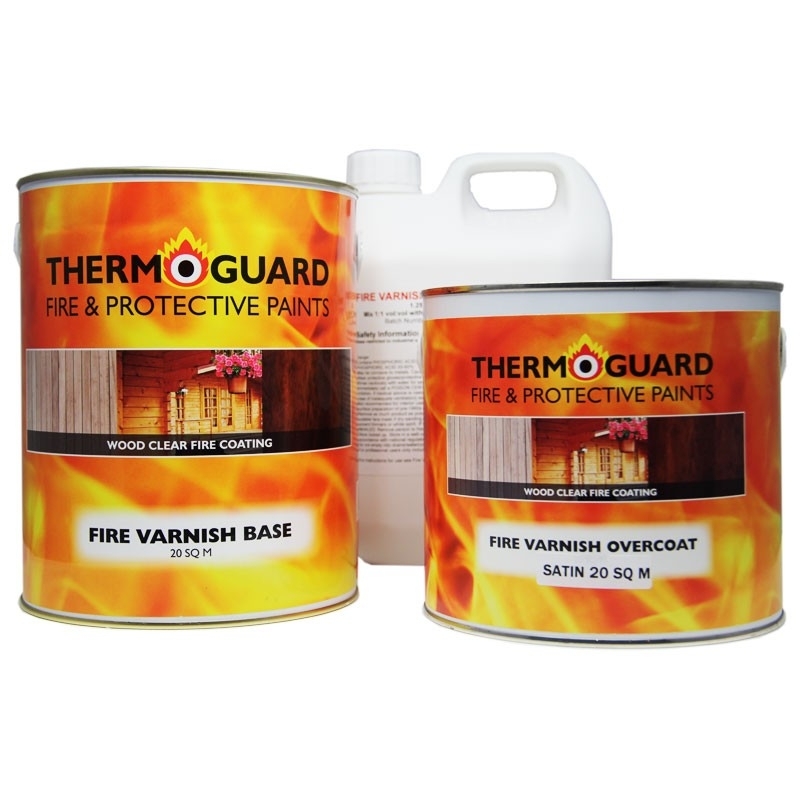 Thermoguard Fire Varnish 30 & 60 Minute System is a clear intumescent varnish for interior and exterior timber surfaces. 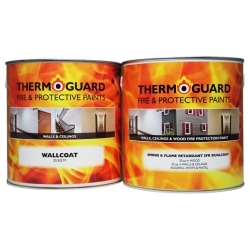 Each pack contains the correct amount of basecoat (Fire Varnish Basecoat) and topcoat (Fire Varnish Overcoat (Interior) / (Exterior)) to ensure protection is achieved inline with the manufacturers recommendations to the respective area in question. 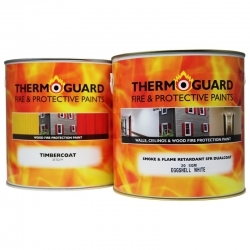 Thermoguard Fire Varnish 30 & 60 Minute System is a clear intumescent varnish for interior and exterior timber surfaces. These packs have been created to help users ensure they are purchasing sufficient product for their project. 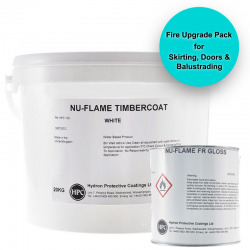 Each pack contains the correct amount of basecoat (Fire Varnish Basecoat) and topcoat ( Fire Varnish Overcoat (Interior) / Fire Varnish Overcoat (Exterior)) to ensure protection is achieved inline with the manufacturers recommendations to the respective area in question. To achieve 30 & 60mins + EN Class B s2 d0 and BS Class 1/0 minimum thicknesses apply of which approval must be sought before purchase. A gloss finish is available in both interior and exterior versions in batch quantities for large projects. We have an indicative 30min Fire Test at a UKAS Fire Test Laboratory demonstrated 10mm loss to charring on plywood & MDF. Our Fire Varnish BS EN Class B Test indicates that softwood did not burn significantly for the 20mins test duration and our previous Class O Part 6 Fire Propagation test indicates that protected softwood did not burn within the 10 minutes test duration. Further in-house testing indicated that when applied at three times the Class B & Class O specification Fire Varnish intumescent added a total of 20 minutes Fire Resistance. We assess projects requiring 30 or 60mins Fire Resistance on an individual basis, referring to the TRADA Char Rate Tables and calculated residual timber to ascertain whether we could issue a Fire Certificate for the project. A written specification should be obtained from the Technical Department for your project prior to use to ensure this system will be suitable. In order to enable us to issue a 30 minutes Fire Certificate in the case of softwood the surface must be able to afford the loss of 8mm depth from all surfaces exposed to a fire. For 60 minutes we assess based on 30mm loss during the fire. For oak or similar woods the loss to take into account is 5mm for 30mins and 17mm for 60mins. Underside of a floor to support the anticipated weight load on the floor. A timber wall should still be able to support itself without the fire passing through to the area the other side. Timber must be clean and thoroughly dry prior to application (maximum 18% moisture content). Can the product ref: FV3060 be applied over an existing varnished door (i.e. not need to be stripped) and do extra coats increase the fire rating minutes? No, Thermoguard Fire Varnish 30 & 60 Minute System cannot be applied over existing varnish on a door but Envirograf Door Upgrade Varnish System can. Can this product (external) be over painted with a shed/fence type wood stain at a later date and still retain it's fire protection? Many thanks Dave. No. Something like Zeroflame Fire Retardant Treatment can be overcoated with waterborne stains or varnishes as long as they are compatible, non-flammable and will dry. We always recommend to try a small sample area first to ensure the stain does not react with the Zeroflame Fire Retardant Treatment and will dry out. However this only achieves Euroclass B (BS Class 0) Fire Propagation and Spread of Flame fire protection and has to be applied to bare (not man-made) timber only. Can this product be used over timber that has been coated with a water based wood stain. Many thanks Dave. Please see below the manufacturers recommendations (at the time of writing this response) when using the Thermoguard Fire Retardant Varnish system over existing wood stains. Penetrating Wood Dyes / Spirit Stains based on low flash solvents (eg Xylene, Toluene, Alcohols). Benefits are – Quick drying, do not seal wood. Penetrating Wood Dyes based on Water (not water repellent). Precaution - wait for all water to come out of wood before overcoating. Nitrostain, White Spirit Penetrating stains (single coat of matt only). Precautions - Allow to dry thoroughly (up to 2 weeks for white spirit) Degrease with warm detergent solution necessary with some sanding required if a solid film has been formed. Stains containing Water Repellents, Waxes, Oils, Coal Tar Distillates / by-products, satin or gloss woodstains or other stains which seal the wood or stains that deposit a weak film of underbound pigment. “Home recipes” combining stains and lacquers. N.B. Consult the Technical Department if these have been applied already or if in doubt. Long oil Varnish, Yacht Varnish or Polyurethane Varnish - Require thorough sanding to give a “key”, Non water-repellent organic solvent preservative (provided thoroughly dry). For others please consult the Technical Department. Photographic faced hardboard, CCA “Tanalised” or water-repellent grade preservative treated timber. Emulsion paint, old “1st generation” type clear fire coatings*. *If these may be present, contact Technical Department for specific advice, tests etc. Paint should be overcoated with a suitable Thermoguard Timbercoat system in chosen colour. Paints cannot be successfully coated with a clear fire varnish because adequate abrasion of hard or smooth paint damages the colour, while softer emulsions & acrylics cause the varnish to craze or shrivel. Can this be used on external decking? No, Zeroflame Fire Retardant Treatment, Thermoguard Thermoproof Exterior Fluid and Hydron Nu-Flame Clear Impregnation can all be used on exterior, bare, porous timber decking but these will only achieve BS Class 1/0 and/or Euroclass B and not 30/60min protection. I have a single storey timber built annex that needs fire retardent applied externally to one side only. The area that needs protection is 70 foot long. 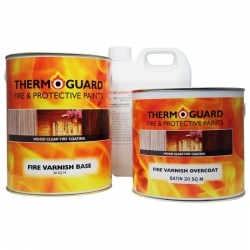 I am thinking of purchasing the Thermoguard Fire Varnish 30 & 60 Minute System. Can you please advise how much I would need. Many thanks. Could you advise what level of fire protection you require, the height of the area, the thickness of the wood to coat and whether it is bare or previously coated with something? Does this product have a UL rating and does it meet ASTM standards? Thermoguard Fire Varnish has NOT been submitted to either UL or ASTM for approval/testing. After use, certification can be applied for HERE. 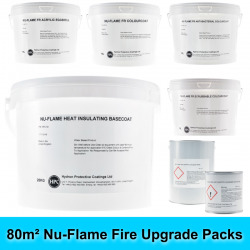 This pack provides sufficient intumescent basecoat (Zeroflame Aquasteel WB+) and coloured topcoat (Zeroflame Aquasteel WB+ Finish) to protect suitably primed, standard structural steel beams and columns in internal environments to 30 minute fire resistance.